A fallen angel and a tiyanak join forces to create a superhero whose good deeds will be the two creatures’ ticket back to heaven. They have their eyes on Inday, a barrio lass who finds out she is adopted during her foster mother’s death-bed-confession. Inday sets out to find her roots by going to Manila and seek employment in the household where her true mother previously worked. While working as a maid, Inday puts up with Kokay’s antics, the mayordoma of the household who hates Inday’s guts. Inday also encounters the man who would make her heart skip a beat, Jeffrey, an enigmatic rich boy, secretly a superhero by night. Inday’s stint in the city soon spirals into a fantastic web of adventure and conflict as the fallen angel and tiyanak watch over Inday to make sure she will pass the tests given her. If she does, Inday will be given full powers to become the ultimate superhero who will help destroy the enemies of the city. 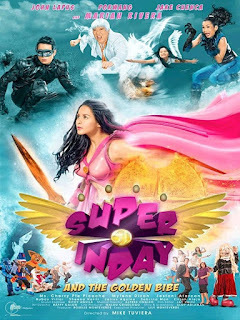 Super Inday and the Golden Bibe is a remake of the original 1988 movie starring Maricel Soriano and a fantasy-adventure flick official entry to 36th Metro Manila Film Festival–Philippines 2010 of Regal Entertainment co-produced with Regal Multimedia, Inc. on December 25, 2010. This stars Marian Rivera as Super Inday and John Lapus as the Golden Bibe.